Buyers looking at buying a fixer upper in Bakersfield CA will want to read this article for helpful tips on the buying process and financing options. One great thing about fixer uppers for sale in Bakersfield is that there is often plenty to choose from. 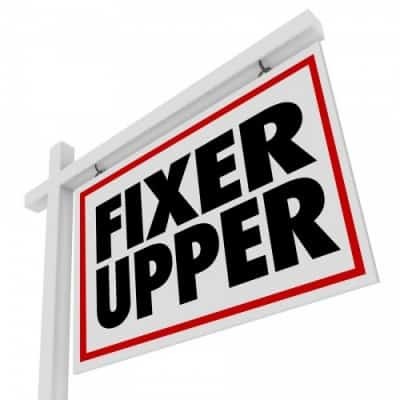 Bakersfield offers many many fixer upper properties for sale and buyers looking to put in a little elbow grease will likely reap some great rewards. If you’re considering buying a fixer upper in Bakersfield CA then just like any home purchase you’ll want to do due your due diligence before closing on the home. This means doing your traditional inspections like a home inspection and pest inspection just to name a few. It’s often a good idea also during your home inspection period to have a contractor evaluate the home so they can advise you what the costs will be to bring it to your “repaired” condition. Many fixer upper homes in Bakersfield are priced for quick sale to begin with but without having the right information on what your remodel costs will be you might pay to much for the home despite the deal you think you’re getting. One important factor about buying a fixer upper in Bakersfield CA is how you’re going to pay for it. Believe it or not there are programs available for buyers to purchase fixer upper properties other than just paying cash. Programs such as an FHA 203k, HomePath Mortgage, HomeStyle Mortgage and Private Money financing are all ways to purchase homes that need a little TLC if you dont have the cash to purchase the home out right. • 3.5% down payment based on as-improved value. Seller contributions can be up to 6%. • $5,000 minimum repair up to a maximum of $35,000. • Available for owner-occupied, primary residence only. Standard FHA guidelines apply. • Repairs can include kitchen/bath remodel, new plumbing, appliances, flooring and much more. • Light renovation costs up to $35,000. • Available for primary residences, second home and investment properties. • Appraisal required to establish the as-completed value. • 15 and 30-year mortgages. • Down payment can be funded as a gift. • All renovation work must be completed by a licensed contractor. • Renovation must be completed within 12 months of loan closing. • Minimum 5% down payment from borrower’s own funds. • Minimum 700 credit score. • Minimum of 35% down payment on appraised value. • No restrictions on how many loans a borrower can have. • Approval is based primarily on property value and borrowers down payment. • Can be used on any type of property, i.e. investment, owner occupied, commercial, etc. Looking to purchase a fixer upper in Bakersfield CA? Take a look at these properties for sale! Hopefully this article has helped you understand more about buying a fixer upper in Bakersfield CA. If you have any additional questions, please feel free to contact us or leave a comment below!